2014 Exhibition | William Wegman - "Fauna"
DEADLINE PASSED- Thank You for Entering! PhotoAlliance invites entries for a photographic competition juried by internationally renowned artist William Wegman. Wild or domesticated, we share the world with animals. For some, as a source of inspiration, delight or companionship and for others as something else entirely. Whatever the connection, a broad range of interpretations in photography is invited for entry, including documentary, expressive or experimental. Submissions may be depicted in any style and represent any species, whether real or of the imagination. Selected works will exhibited at Smith Andersen North Gallery from October 25th thru November 20th, 2014. Works will be featured on the PhotoAlliance.org website garnering international viewing. 'Best of Show’ winner will be awarded a full scholarship to the PhotoAlliance 2015 Our World Portfolio Review in San Francisco. Entry Fee (non-refundable): $45 for up to 5 images. Show runs: October 25th thru November 20th, 2014. We have an exciting new alliance with LensCulture, a site that shares our goals of supporting contemporary photography throughout the world. We will use the state of the art LensCulture entry tool for submissions. Logon on now to create an account and upload your application. William Wegman was born in 1943 in Holyoke, Massachusetts. He received a B.F.A. in painting from the Massachusetts College of Art, Boston in 1965 and an M.F.A. in painting from the University of Illinois, Champagne-Urbana in 1967. From 1968 to 1970 he taught at the University of Wisconsin. In the fall of 1970 he moved to Southern California where he taught for one year at California State College, Long Beach. By the early 70s, Wegman's work was being exhibited in museums and galleries internationally. It was while he was in Long Beach that Wegman got his dog, Man Ray, with whom he began a long and fruitful collaboration. Man Ray, known in the art world and beyond for his endearing deadpan presence, became a central figure in Wegman's photographs and videotapes. Wegman has created film and video works for Saturday Night Live and Nickelodeon and his video segments for Sesame Street have appeared regularly since 1989. His videos include Alphabet Soup, Fay's Twelve Days of Christmas and Mother Goose. In 1995, Wegman's film The Hardly Boys was screened at the Sundance Film Festival. 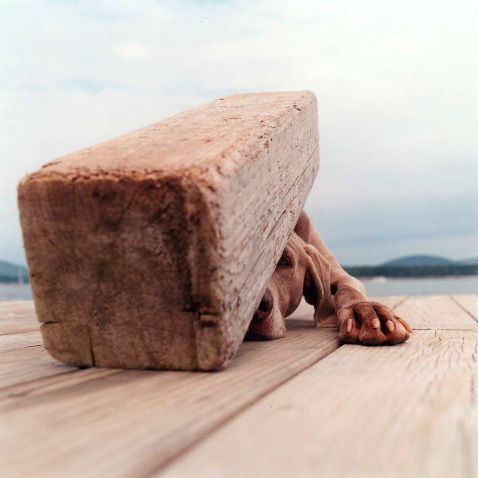 Numerous retrospectives of Wegman's work have been made among them "Wegman's World," which opened at the Walker Art Center and toured the United States and "William Wegman: Paintings, Drawings, Photographs, Videotapes," which opened at the Kunstmuseum, Lucerne traveling to venues across Europe and the United States. More recent exhibitions have included retrospectives in Sweden, Japan, Korea and Spain and, most recently the exhibition "Funney/Strange," which opened at the Brooklyn Museum of Art. William Wegman lives in New York and Maine where he continues to make videos, to take photographs and to make drawings and paintings.